Is Tech Making Life Better or Worse? Tech is ruining our life. Or at least that's what plenty of people are suggesting. There's evidence showing that culturally we're more depressed and distracted than ever, and tech has at least some responsibility for that. Yet at the same time tech is providing rich opportunities to grow and learn. So which is it? Is tech making it more difficult to thrive? Or is it helping us thrive? They stay grounded in the face of distraction. They use technology to know themselves on a deeper level. They know when and how to use technology to train their brains to reach their full potential. They structure their surroundings to create a habitat for happiness. They innovate consciously to enrich the world around them. I look forward to sharing Amy's insights with you in this episode. 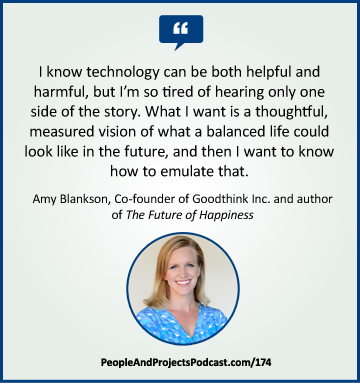 Learn more about Amy and her company at GoodThinkInc.com. Project managers know that managing our stakeholders is critical to our project success. But how can we take time to develop relationships when we're slammed with an overwhelmed schedule? Check out our Dirty Little Secret of Business e-learning course. Learn practical skills to develop stakeholder relationships by visiting http://courses.i-leadonline.com/courses/the-dirty-little-secret-of-business. Thanks! RETROFUTURE CLEAN and LIFE OF RILEY by Kevin Macleod Licensed under a Creative Commons: Attribution 3.0 License.